Progressive regulator with separate color chamfer. Exclusive solid wooden case with front and side glass. 8-day Westminster Chime movement. Grid pendulum, dial printed. Easy to read Arabic numerals. Auto night shutoff. Ice Beech finish. Dimensions: 22.4 x 8.9 x 5.1 inches. Made in Germany. German made regulator with separate color chamfer. Exclusive solid wooden case with front and side glass. 8-day power source. 1/2 hour strike movement. Grid pendulum, dial printed. Easy to read Arabic numerals. Black finish. Dimensions: 22.4 x 8.9 x 5.1 inches. Made in Germany. Progressive regulator with separate color chamfer. Exclusive solid wooden case with front and side glass. 8-day Westminster Chime movement. Grid pendulum, dial printed. Easy to read Arabic numerals. Auto night shutoff. Maple finish. Dimensions: 22.4 x 8.9 x 5.1 inches. Made in Germany. German made regulator with separate color chamfer. Exclusive solid wooden case with front and side glass. 8-day power source. 1/2 hour strike movement. Grid pendulum, dial printed. Easy to read Arabic numerals. Maple finish. Dimensions: 22.4 x 8.9 x 5.1 inches. Made in Germany. Progressive regulator with separate color chamfer. Exclusive solid wooden case with front and side glass. 8-day Westminster Chime movement. Grid pendulum, dial printed. Easy to read Arabic numerals. Auto night shutoff. Walnut finish. Dimensions: 22.4 x 8.9 x 5.1 inches. Made in Germany. German made regulator with separate color chamfer. Exclusive solid wooden case with front and side glass. 8-day power source. 1/2 hour strike movement. Grid pendulum, dial printed. Easy to read Arabic numerals. Walnut finish. Dimensions: 22.4 x 8.9 x 5.1 inches. Made in Germany. This modern regulator is different from the classic regulators because of the metal inlays on both sides of the front door and they give the clock a completely new face. Exclusive solid wooden case with front and side glass. Wooden pendulum , dial printed. 8-day mechanical 4/4 Westminster movement. Dimensions: 22.8 x 8.9 x 5.1 inches. Made in Germany. Named for the prominent Vienna composer in the Biedermeier or Classical/Romantic style, this elegant piece is a beautiful example of that aesthetic. Biedermeier works have a tendency to exhibit an atmosphere of quiet contemplation and a powerful simplicity of style. Clearly a timeless classic, this clock has a cable-wound precision movement with automatic beat adjustment and maintaining power. This means that the clock will continue to run, even while you are cranking the weight cable once per week. The Schubert is a true miniature regulator, with a very short drop for the weight, making it a rare and very special timepiece. The architecturally styled top and bottom are adorned with burled wood accents. 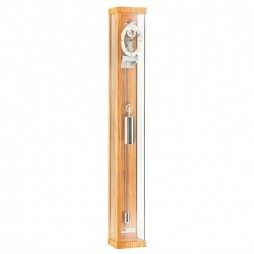 This piece is fitted with a beveled-glass door and is surrounded by glass on three sides. 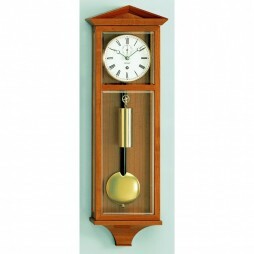 This cabinet style wall clock will make a perfect addition to your home or office. 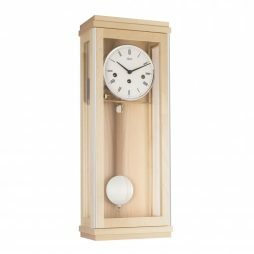 This lustrous cherry cabinet wall clock displays in classical Arabic numerals, complete with a lovely swinging pendulum. 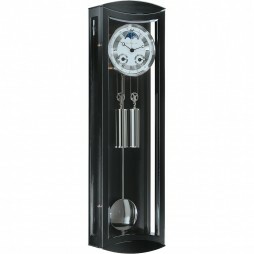 This unique chiming wall clock plays 4/4 Westminster and Bim Bam chimes. Perfect to add a sophisticated look to your home. 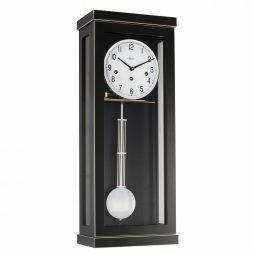 Featuring smooth, simple lines, and a dark polished case, the Hermle Greenwich Mechanical Regulator Wall Clock ( Black) is certain to add its own special glamour to your living room or study. The polished black finish of its case enables its white dial, to stand out while highlighting the silvery appeal of its weight and pendulum. This elegant timepiece also comes with beveled glass panels, a bezeled dial which has been designed to indicate hours, minutes and seconds and a 30-day weight-driven movement. There are certain combinations you can never go wrong with. Functionality and style is one of them. And thanks to the Hermle Mornington Mechanical Regulator Wall Clock (Walnut) you can get to add the very special appeal this combination brings to any room of your choice, in your home. This wall clock?s tastefully decorated face, with a moon phase feature, silver chapter ring with black Roman numerals and nickel plated bezel is instantly noticeable against its medium brown polished walnut case. The dial also provides indicators for dates, days and months in addition to hours and minutes. 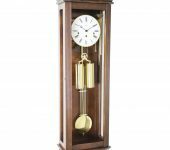 Additional features of this spectacularly designed clock also include its nickel coated pendulum and weight as well as an 8-day cable-driven movement. 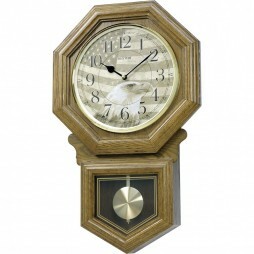 American Patriot Wooden Musical Clock is a fantastic wall clock that’ll effortlessly spruce up the ambience of your home. Designed by Rhythm Clocks, this telltale has an eclectic American oak finish. Its dial has a beautiful image of the America’s national bird and flag. The vintage look that the dial has will add seven stars to the look of your walls. 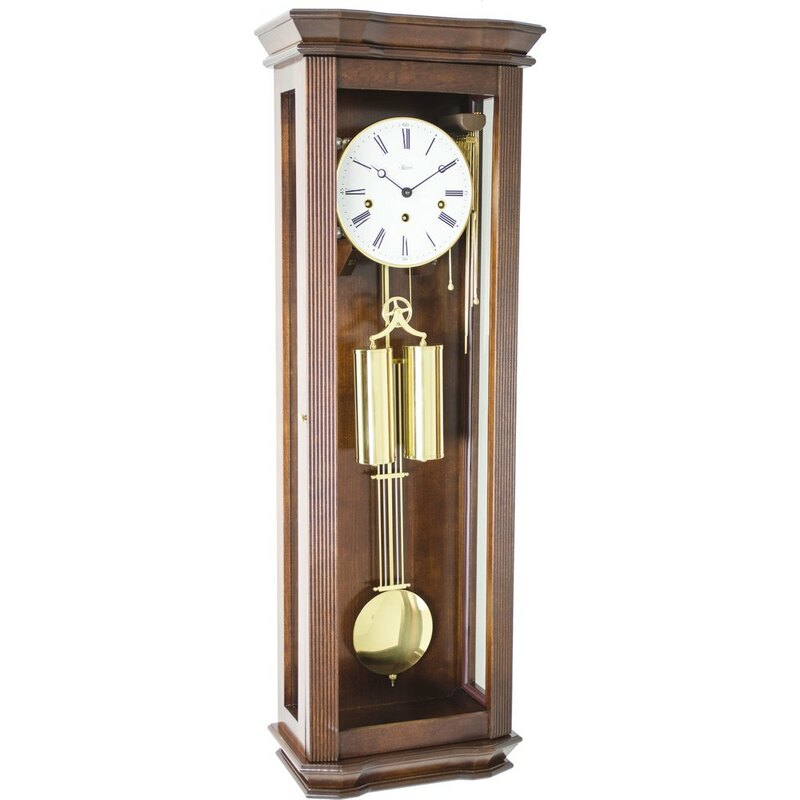 The tradition school house shape and seraphic pendulum of this clock make it a perfect accent of an American house. This battery operated quartz clock plays melodious tunes at every hour strike. Also it comes loaded with features like automatic shut off, night sensor etc. There is nothing quite like an antique style glamour that can make any room or setting come alive especially when provided by a traditional styled clock such as the Hermle Brooke Mechanical Regulator Wall Clock (Oak ). 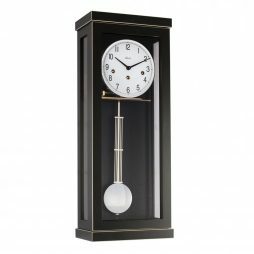 This distinctive wall clock which comes in a highly polished oak case with a crown bonnet and glass panels has also been fitted with a large beveled face which contrasts with its black Roman numerals and spade hands. The item has also been designed with an R&A bob with a grid pendulum and a mechanical brass 8-day key wound movement which plays 4/4 Westminster chimes. Create an atmosphere of stylish refinement with the Hermle Staplehurst Regulator Wall Clock. Slender, sleek and elegant, its highly polished antique walnut finish and bronze colored pendulum are immediately noticeable. But that is not all there is to this regulator wall clock which is a testimony to Hermle?s well-deserved reputation for excellent clock design. Supplementary decorative moldings further add to its appeal in addition to its extra features which include a mechanical 8-day cable-driven 4/4 Westminster movement and an automatic night shut-off. Step back in time with the Ashford Regulator Wall Clock with its wood veneer case in Old World walnut finish. Enjoy the Westminster melody on the hour. It also features decorative screened glass and Roman numerals. This is truly a timeless piece! Sporting a stylish look, this Howard Miller Elliot Schoolhouse Wall Clock will adorn your wall. This special anniversary edition wall clock is inspired by the classic School Days style of wall clock. This 75th Anniversary Edition off-white dial features black Arabic numerals and spade hands, and a convex glass. Featuring gold-tone detailing accents the lower glass, this piece is a perfect gift for a friend. The Katherine Schoolhouse clock is an expertly designed Howard Miller wall clock that builds on a classic regulator design with a distinct octagon shape. This is a classic clock with deep moldings that creates the beautifully crafted octagon shape of the clock. This chiming wall clock is adorned with off-white Arabic numeral dial with a polished brass-finished tone bezel and decorative hands. Complete with a lustrous polished brass-finished pendulum. Comes with a volume control finish with an automatic nighttime shutoff option. This schoolhouse clock is battery operated with dual-chime Kieninger movements plays full Westminster or Ava Maria chimes. 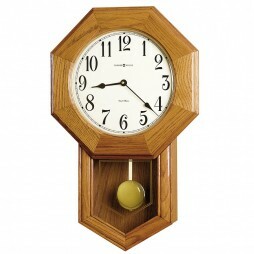 This octagon clock is made from select hardwoods and veneers finished with a stunning Oak Yorkshire finish. A true piece of art that will make an excellent addition to your walls. Add a touch of elegance to your home with this classic wall clock. Beautifully designed after a traditional Jewelers Regulator clock and made in the US. This lovely wall clock has dentil molding wraps around the pediment and diagonally cut oak overlays that appear at the upper corners of this regulator wall clock. 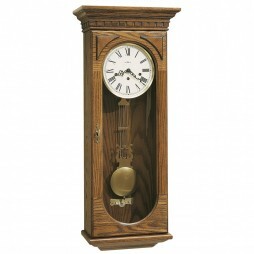 This chiming clock is made with select hardwoods and veneers with a Oak Yorkshire finish; with other features that include a front opening locking glass door; a perfect feature that goes great with the clocks polished brass lyre pendulum and beat plate. This is a key-wound clock with a Westminster chime Kieninger movement that plays 1/4, 1/2, and 3/4 chimes accordingly, with full chime and strike on the hour. Looking to unwind in silence? This oak wall clock has a volume control option to get the quiet time you need, when needed. If you want to create a distinct and elegant look to your walls, this beautiful oak clock will do the trick. 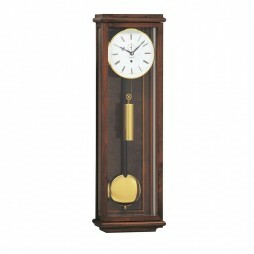 The Palladio is a classic German regulator wall clock with beautiful features. It goes perfectly with any type of decor and will make a perfect addition to your home or office. This clock was made in Germany and has a solid wood case. It also has beveled crystal glass with a beautiful polished grid pendulum. 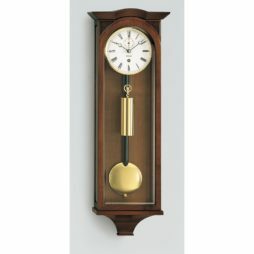 This wall clock also has a unique antique walnut finish that accentuates the full beauty of this clock. It also has an enamel dial and has a separate seconds dial. Bring beauty to you home when you add this stunning German wall clock. This is a beautiful and elegantly crafted wall clock that you will love to have in your home or office. 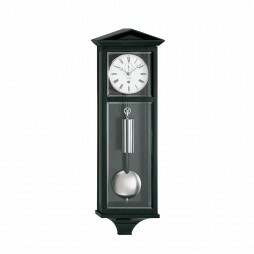 This clock was made in Germany and has a beautiful black lacquer finish with chrome accents. This clock also has Walnut burl veneer back panel and crystal glass panels. This clock also has 8-day power reserve with hour and half-hour strike on coiled gong. It also has a beautiful enamel dial with open escapement. This unique regulator wall clock is beautiful in both style and design. It’s the perfect clock that will fit any decor. 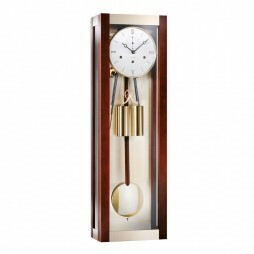 Add a contemporary touch to your home or office when you add this beautiful regulator wall clock. This clock is a weight-driven wall clock and is named after the Empress Elisabeth Amalie Eugenie of Austria. This timepiece has cable-wound precision movement with an automatic beat adjustment feature and maintaining power. The Amalie also has a very short drop for the weight. 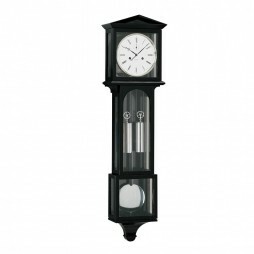 This clock was made in Germany and has a black lacquer finish with chrome features. It also has seconds and calendar complication that tells you the day, date, month and monophase. This clock also has a sliver-plated dial and blued steel, Breguet hands. This is a beautiful clock inspired by rich history you will love to have in your home or office. This is a remarkable and eye-catching timepiece with elegant qualities you’ll love. This clock was named after Princess Sophie of Bavaria (1805-1872) and is the smallest miniature regulator available. This is a cable-wound clock with precision movement and has an automatic beat adjustment feature and maintaining power. The Sophie has a very short drop for the weight. This wall clock was made in Germany and has a beautiful French walnut finish with burl and brass features. This wall clock also has a diamond-turned dial with seconds complication. This is a stunning wall clock that can easily embellish either a modern or traditionally decorated room. Take home this beautiful timepiece that is truly a timeless classic. This clock by Kieninger is made in Germany with a black lacquer finish and chrome features. This is a cable-wound clock with precision movement and has an automatic beat adjustment feature. This clock also has maintaining power which means the clock will run even while you're cranking the weight cable once per week. The most stunning feature of this clock is its elegant case that is the epitome of style and taste.This wall clock also has an enamel dial and blued steel, Breguet hands. This is a beautiful German wall clock that will make a stunning presentation piece in your home. This is a beautiful miniature regulator by Kieninger that will make a stunning statement in your home or office. This clock is a traditional Vienna Regulatory style from the Biedermeier period named after its iconic roof atop the beautifully proportioned cabinet. This is a unique regulator clock that has a very short drop for the weight. 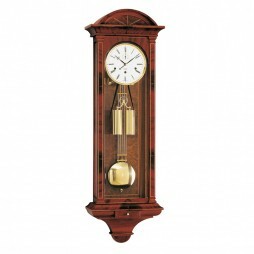 This clock is made in Germany and has a natural cherry finish with brass features. This timepiece also has cable-wound precision movement. It also an automatic beat adjustment feature and maintaining power. This means the clock will run even while you're cranking the weight cable once per week. This mechanical wall clock has a beautiful enamel floating dial and has an elegant case that completes the look of this timepiece. 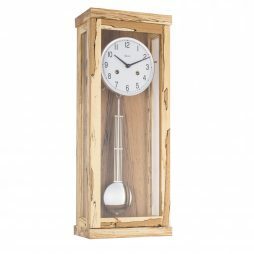 It's a lovely timepiece with extraordinary qualities you'll love to have in your home. Take home this beautifully designed and special wall clock for your home or office. The Dachl is a true miniature regulator with a very short drop for the weight. The Dachl is named for its iconic roof atop the beautifully proportioned cabinet. It?s a timeless classic with features that make this clock truly unique. This clock is a cable-wound clock with a precision movement that has an automatic beat adjustment and maintaining power. With this feature, your clock will continue to run, even while you're cranking the weight cable once per week. This clock also has an enamel floating dial and elegant case that captures the true essence of beauty. 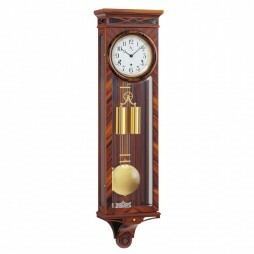 This clock is made in Germany and has a Natural cherry finish with brass features. This clock is a beautiful and decorative piece that you'll love to have in any room in your home. Add a contemporary and modern touch to your home when you add the Asymtrique clock to your home. 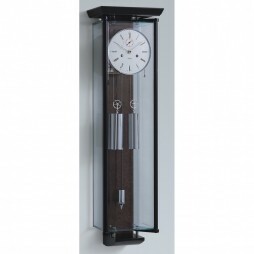 This sleek and narrow wall clock is displayed as a narrow pillar on your walls. The slender case of this clock accentuates the beautiful of any room with modern elegance. This clock was made in Germany and has a black lacquer case with chrome features. It also has 8-day power reserve with drop-off bell strike. This regulator clock also has an automatic beat adjustment feature with skeleton movement. 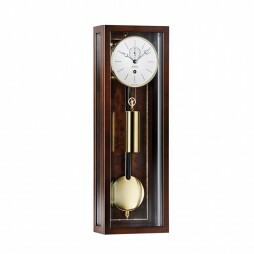 Other features of this clock include the clock's long carbon pendulum with scale. It also has a crank key compartment. The Asymtrique is a stunning regulator wall clock that will look lovely in a contemporary-styled home. Add a pop of color to your walls when you add this beautifully designed timepiece. The Asymtrique is a narrow timepiece that has a vibrant red lacquer case with chrome features. This timepiece is made in Germany and has a limited edition production of 50 pieces. This unique and innovative clock has an 8-day power reserve with drop-off bell strike. It also has an automatic beat adjustment feature with skeleton movement. 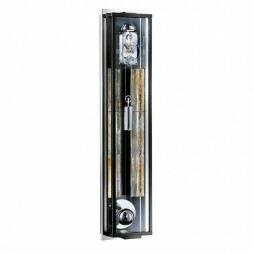 This clock is a unique presentation piece that presents itself as a narrow pillar on the wall. The long and slender case of the clock will create a beautiful atmosphere of modern elegance. This is an elegant timepiece that is the true definition of modern elegance. The Asymtrique is made in Germany and made with olive-wood veneer with chrome features. It also has an 8-day power reserve with drop-off bell strike. This clock has skeleton movement and an automatic beat adjustment feature. 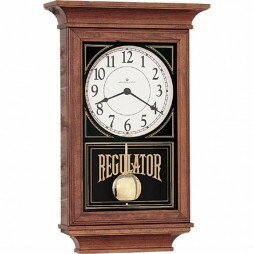 This regulator clock has a large bell that gives off pleasing sounds that strike every hour. This timepiece presents itself as a narrow pillow on the wall. Its slender case creates the look of elegance that you’ll love to have on the walls of your home. This is an innovative and stunningly designed timepiece with eye-catching features. The Spherica is a regulator clock with visible movement. This clock combines innovative features such as a perfectly spherical pendulum bob that create the optical effect in the enlarging mirror. 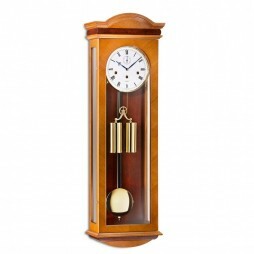 Aside from the unique features that this clock has, it also has a large bell that gives off a pleasing passing single strike every hour. This clock was made in Germany with a limited edition production run of only 100 pieces. 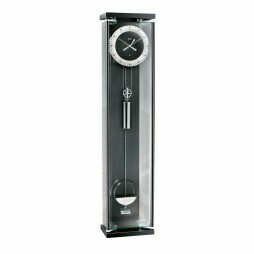 This mechanical regulator clock has black lacquer and chrome features. It also has an 8-day power reserve with drop-off bell strike. Other stunning features that this clock has to offer are decorative fins and an open escapement. This sleek and innovative clock will help define any modern-styled home. Own a clock that combines modern design and stunning craftsmanship. The Spherica is a stunning regulator clock that has innovative features such as a spherical pendulum bob that create the optical effect in the enlarging mirror directly behind the clock. This sleek and elegant regulator wall clock are made in Germany with dark ebony veneer,black lacquer, and chrome features. This clock also has an open escapement which accents the spherical pendulum bob. The Spherica also has decorative fins and enlarging mirror along with a hidden crank key compartment. This unique clock has a limited edition production run of 100 pieces which makes this clock a wonderful piece own in terms of value. 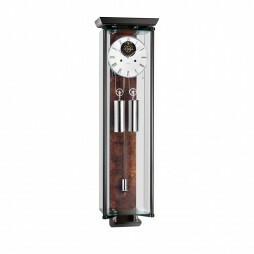 This monumental regulator clock is sophisticated in both design and taste. It’s the perfect eye-catching statement piece to add to your home or office. This is a beautiful wall clock with a sleek and innovative design that you will love to have in your home or office. 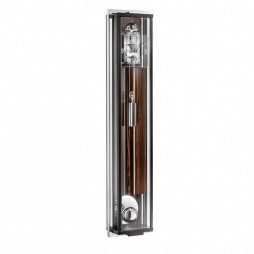 The Ardesia is a monumental regulator clock that has curved crystal glass, oiled slate back panel and chrome features. 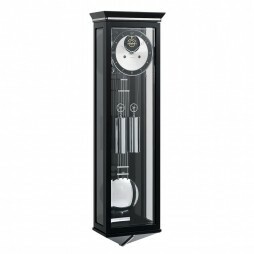 This unique wall clock has a beautiful view of this clock’s stunning mechanism and carbon pendulum through the large curved glass. This clock also has an 8-day power reserve with drop-off bell strike and an automatic beat adjustment feature. This timepiece also has a hidden crank key compartment. Give your home a modern charm with this lovely Kieninger timepiece. 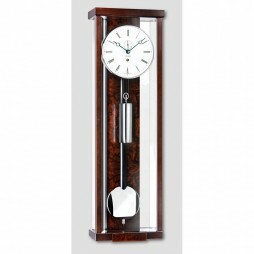 Define the beauty and environment of your home with this beautiful Rosewood regulator wall clock. 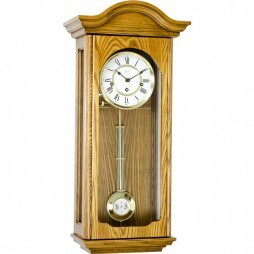 This wall clock has beautiful wood character and is made with selected hardwoods. Beautiful Westminster chimes fill the room with comfort and warmth when played on the long chime rods. It also has a three-train movement that will strike the hour on the hour. This alluring timepiece also has blued steel, Breguet hands, and beveled crystal glasses. It also has a convenient compartment for the winding key. The Rosewood has a beautiful wood character that will make a lasting impression on those who view it. This is an alluring timepiece that is guaranteed to attract the attention of any knowledgeable clock connoisseur. 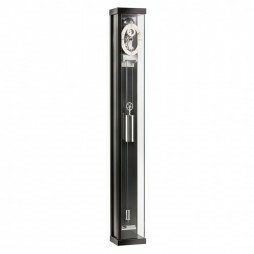 This mechanical key wound wall clock is the perfect example of modern design with an elegant charm. The Clement is a limited edition horologic masterpiece. Only 100 pieces were created to help celebrate Kieninger’s 100 anniversary in 2012. This innovative and alluring timepiece has a nice exhibition glass case and black lacquer as well as carbon fiber accents.This clock features all the elements of a true mechanical regulator. 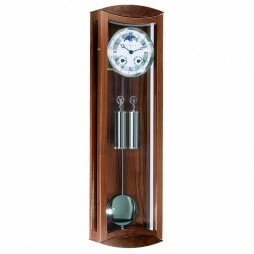 This clock has a carbon pendulum rod that maintains proper length through minute temperature changes. A unique and innovative feature that truly makes this clock stand out. This clock also has maintaining power in the weights which means the clock will not slow down during the winding process. It has 1-month power reserve with 8 ball bearings and 6 jewels. It also has Geneva stops and Kieniramic anchor pallets. This wall clock is truly the epitome of beauty and style. Get a regulator wall clock that is an extraordinary example of horology. This is a beautiful timepiece that will attract the attention of any knowledgeable clock connoisseur. 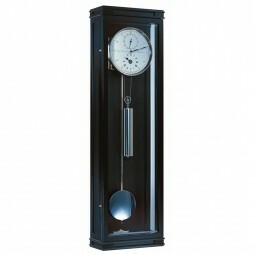 This unique clock was made in Germany and has black lacquer, chrome features with walnut burl accent and inlay. This wall clock has a robust mechanism and is our only three-weight cable wound regulator. 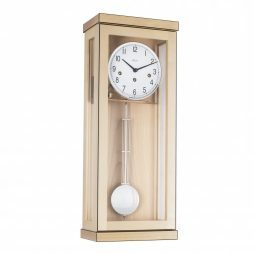 The massive curved crystal glass case features impressive burl and inlay features that give this clock a stunning appeal. This unique clock is a cable-wound clock with precision movement. It also has automatic beat adjustment and maintaining power. With this feature, your clock will continue to run even while you’re cranking the weight cable once per week. 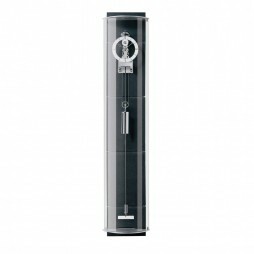 This clock also features an 8-day power reserve and plays a Westminster chime melody on long tuned steel rods. The beautiful pendulums of this clock are long and takes a full second to tick. This beautifully designed wall clock is a perfect statement piece to add to your home or office. This is a beautiful wall clock with stunning and innovative design features you’ll love. This unique timepiece has an innovative lighter-than-air case with beautiful glass panels. 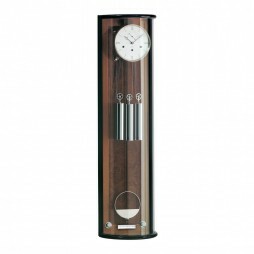 This clock also has a stunning fine black lacquer finish with chrome features and a walnut burl accent. This clock has cable-wound precision movement and automatic beat adjustment with maintaining power. This means that this timepiece will continue to run, even while you crank the weight cable. This clock also has an 8-day power reserve with hour and half-hour strike on a large gong. Other unique features that this clock has are Kieniramic anchor pallets and jeweled escapement. The clock has a beautiful enamel dial with open escapement as well as a carbon fiber pendulum. This is a unique timepiece that will fit beautifully with any modern and industrial aesthetic. This is a beautiful German wall clock that will bring a classical charm to any room. This regulator wall clock was made in Germany and has a stunning chocolate walnut finish with chrome features and stainless steel accents. This German regulator wall clock also has cable-wound precision movement with automatic beat adjustment and an automatic night off feature. This timeless wall clock also has a silver plated dial with seconds and calendar complication that show the day, date, month and moonphase. It also has an 8-day power reserve with hour and half-hour strike on a large gong. This is truly a timeless classic and is a stunning wall clock that will fit with any decor. This is a beautiful regulator style wall clock by Kieninger. The Chesterfield is a massive regulator clock in high Vienna style. This beautiful clock was made in Germany and is made with a natural cherry finish with inlay and burl. This clock also has three beveled crystal glasses and Vienna hands. This clock also has an enamel dial with seconds complications. It also has 8-day power reserve and plays a Westminster chime melody. The melody of this clock plays on long tuned steel chime rods. This wall clock is the epitome of style and elegance, with beauty that will make a grand statement in any room. This is a massive regulator in high Vienna style. The Laterndl (short for Laterndluhr) is a traditional Vienna Regulator style of the Biedermeier period named for its similarity to a lantern. Antique Laterndluhrs from the early Nineteenth Century are among the most sought after by collectors and connoisseurs. Clearly a timeless classic, this clock has a cable-wound precision movement with automatic beat adjustment and maintaining power. This means that the clock will continue to run, even while you are cranking the weight cable once per week. The Laterndl also strikes the hour and once on the half-hour ringing a large coil gong. The strike train includes an automatic night shut off for your convenience. The enamel floating dial and elegant case bespeak the epitome of style and taste. This clock is one of our most popular models and is a favorite among our employees. Decorate your walls with a wall clock that has stunning features guaranteed to bring a unique character to your room. This timepiece is both elegant and modern and is perfect for any minimal or industrial aesthetic. 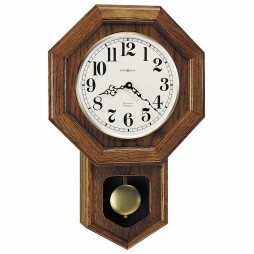 This wall clock was made in Germany and is made with a beautiful French walnut finish. It also has brushed, anodized aluminum accents. This regulator wall clock plays a nice Westminster chime melody on long tuned steel rods and has an automatic night-off feature. This modern wall clock also has a silvered dial with large seconds complications. Add this wall clock to your minimalist or industrial style interiors. A beautiful timepiece that makes a stunning statement in design and elegance. 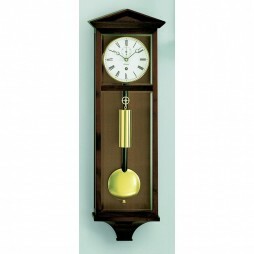 Add a modern and contemporary charm to your home with this weight-driven regulator wall clock. Made in Germany, the Kieninger Mariette features a stunning French walnut finish with burl panels. Glass panels allow you to view the clock from front and sides. The enamel dial, with separate seconds dial; chrome pendulum; weight and accents add to the beauty of this clock. This is a true regulator clock with a short drop for a weight and includes a cable-wound precision movement with automatic beat adjustment and 8-day precision movement. That right, you only have to wind the clock once a week. This is a truly unique and classic timepiece you’ll love to have in your home or office. This regulator wall clock merges state-of-the-art design with elegance. This Kieninger Mariette clock is made in Germany and created with unique chrome features with a French walnut finish. This German wall clock has a diamond turned dial with seconds, calendar and moon phase complications. It features elegant crystal glass panels that complete the look of this clock. The Mariette has a cable-wound precision movement with automatic beat adjustment and maintaining power. This means the clock will run while cranking the weight cable once a week. This rare miniature regulator clock has a very short drop for weight which is an interesting feature you can’t miss! This special timepiece is unique in style and features. A perfect wall clock that is a conversation starter with unique features you’ll love. Sometimes, the finer things in life are the good old-fashioned basics that haven’t been modernized in today’s world. Regulator clocks fit into that mold. Their sophisticated look and effortless timekeeping abilities keep their sales high across the globe. Thankfully, at Expressions of Time, we aren’t immune to the whims of nostalgia. We are diligent in our approach to enjoying the finer things in life as well. 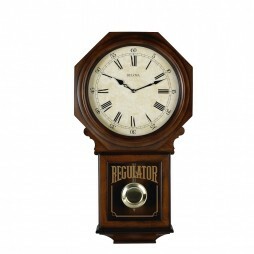 We make it more than apparent with our vast and varied selection of regulator and schoolhouse clocks. And we want to share them with you, our beloved customer. Regulator wall clocks have been around for ages. In fact, anyone interested in their origins can actually trace them all the way back to the late 18th century. And they’ve remained this timeless due to their stellar timekeeping record. Regulator clocks are certainly known for their accurate timekeeping. Their keen ability to stay on track relies on their signature weight-driven mechanism. Later models also upgraded to cable-driven variations, but the same concept was in place. Overall, it’s clear that regulator and schoolhouse clocks were perfected to withstand the test of time. And the beauties of these machines are the reason behind their long-standing placement in people’s homes and offices, even today. At Expressions of Time, we’ve made it our mission to provide you with only the best collection of timepieces out there. Therefore, our regulator and schoolhouse clocks are of the highest quality and pristine craftsmanship, at affordable prices. Our Kieninger collection, for example, leads the way in elegance and refinement. These timepieces are German-made, and can easily outshine even the most beautiful artwork on your walls. The Kieninger Chichester Mechanical Weight-driven Regulator Wall Clock is a masterpiece on its own. It has an automatic beat adjustment and cable-wound precision movements that make it nothing short of graceful. Its long pendulum and weighted cables give it a flawless rhythm that remains true, always. And its crystal, curved glass case makes it shine and catch the eye of any passers-by. Another great model is the Kieninger Classic Key-Wind Regulator Clock. While it appeals to many for its apparent simplicity, it doesn’t lack in flavor. 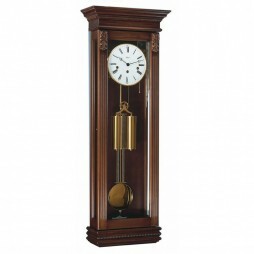 This regulator clock has a tasteful walnut finish, with a Roman dial and grid pendulum rounding out its magnificence. Any model of our Hermle Regulator Clock selection is worthy of a spot on your wall. The Hermle Staplehurst Regulator Wall Clock has 4/4 Westminster movement for essentially perfect rhythm. Beyond that, it has a lovely chiming tone and an antique wood finish that gives it a touch of charm. And its automatic night shut-off capability makes this model a unique yet wholesome timepiece to put on display. 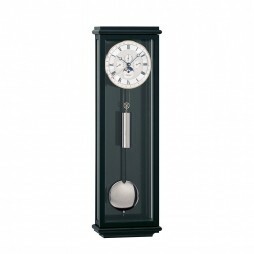 For a symbol of quality and effortless class, choose the Hermle Mornington Mechanical Regulator Wall Clock. Its automatic beat adjustment and chic wooden finish sell this model on its own. Yet its Roman numeral dial is a thing of beauty. It indicates the day, date, month and even the various moon phases for that extra special touch. More favorites include the American Patriot Wooden Musical Clock. This schoolhouse clock comes with lovely images of the national flag and bird, the eagle, across its clock face. Its real allure, however, is its six different musical tones in Americana, Hymn, and Christmas-themed sets. Meanwhile, the Howard Miller Schoolhouse Clock shows off large numerals and a distinctive octagonal shape. These great qualities aside, the polished brass pendulum really gives a satisfying vintage look to this modern piece. Our wide selection of Howard Miller pieces are exquisite and timeless. Any piece you find will make a notable impression in your home. A perfect example of blending the past with the present is the Radio-Controlled Schoolhouse Clock. Following the lead of WWVB signals, this clock can adjust to your specific time zone across the U.S. However, this modern capability in no way detracts from the schoolhouse clock’s appearance. The octagonal design and wooden finish give it an authentic charm. And the ever-present brass pendulum will undoubtedly sway along with the music. 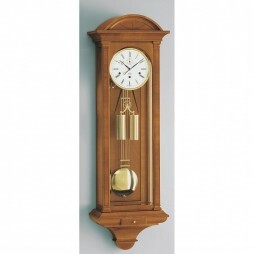 At Expressions of Time, our goal is to offer quality regulator and schoolhouse clocks. They’re so influential; they make a bold, old-fashioned statement all on their own. And creating a modern version of a timeless classic is not easy. However, these regulator wall clocks demonstrate the expert craftsmanship it takes to show an appreciation for their origins. Admiringly, the modern renditions come in countless variations for you to choose from, all with their own unique touches. Decorate your office in vintage standards, topping it off with the timeless schoolhouse clock of your choice. 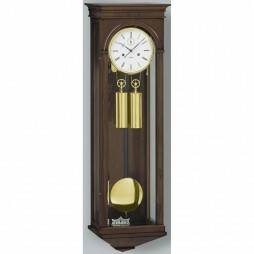 Give your foyer a touch of sophistication with a regal-looking regulator wall clock on display. It doesn’t matter where you decide to hang such a masterpiece. Investing in one of these prime regulator or schoolhouse clocks will be a crowd-pleaser, no matter the location. Shop through our extensive collection on ClockShops.com, and find yourself the essential timepiece for your home. Did we mention we offer free shipping to most U.S. states? And we add no sales tax (except in Missouri) to your order? The affordable price of each individual purchase is all you’re liable for. So spend your time wisely by checking out our website! After all, Expressions of Time is dedicated to satisfying each and every one of our customers with undeniably beautiful products. Beyond that, we highly value each consumer, and do our best to provide exceptional customer service. In fact, we value you so much, we offer a 60-day return policy if you aren’t completely content with your purchase. If you have any questions, complaints or suggestions at all, we happily request your feedback. 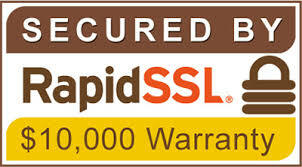 Call our customer service number at (866) 467-6460. We’d love to speak with you!